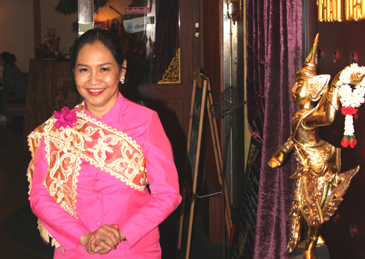 Madam Malliga Vanda greets her customers at "Thai Orchid." "Thai Orchid" was being redecorated by a middle-aged Thai woman in a small physique elegantly dressed by traditional Thai dress when she was visited by the staff of The Seoul Times. 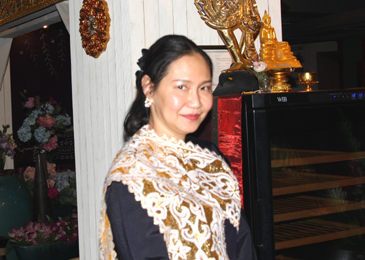 "I took over Thai Orchid just two months ago," said new owner Malliga Vanda. "I just want to turn it into a most famous Thai place with authentic Thai delicacies"
The 90-square-pyeong restaurant was being turned into a place like a gallery decorated by gold ornaments and images by the touch of Vanda. One pyeong equals 3.3 square meters. "The restaurant was almost dying before," she added. "The previous owner gave up running the restaurant"
"I’d like to make my restaurant a very authentic Thai restaurant," Vanda said. "Most Thai restaurants in South Korea are not serving genuine Thai food." "I brought three of her chefs from the five-star hotels in Thailand," she said. "The will make one of the most delicious and most authentic Thai delicacies here with me"
The middle-age Thai woman with a graceful smile was proud that she introduces the real taste of Thailand, "the Land of Smiles," to the local Korean people. "Many diners consider Thai cuisine one of the world's four major delicacies along with Chinese, French, and Italian foods," Van emphasized. Some 70 Thai dishes on the menu of Thai Orchid are made of meat, various seafood, and fresh Thai and Korean vegetables. Meat includes chicken, pork, and beef. Madam Malliga Vanda treats her customers with smile, hospitality. Vanda said that Korean customers favor "Pad Thai," a stir-fried noodle, and various kinds of curry foods. The most popular one is "Poo Nim Pad Pong," stir-fried soft shell cram with yellow curry among the Korean diners. But, "Pad Thai" is favored by most eaters in countries like Australia, Singapore, Indonesia, and other South Asian nations. "The stir-fried noodle with bean sprout and tamarind sauce can come with chicken, pork, shrimp, or beef," Vanda explained. “Tom Yum Goong,” the spicy and sour shrimp soup with lemon grass, was also the perfect taste to most local Koreans, who cherish Thai-style fried rice called "Khao Pad." Thailand's "Tom Yum" soup is one of the world's three best soups along with Ukrainian red soup of Borscht and the french seafood soup of Bouillabaisse. "Tom Yum Goong," "Pad Thai," "Khao Pad," and two other curry dishes are included in the "Seven Foods of Thailand's popular dishes" listed "World's 50 Most Delicious Foods, according to Readers' Pick of CNN Travel. Prices on each menu range from 10,000 to 30,000 Korean won and coffee can be ordered with 3,000 won. Such Thai beers as Singha and Chang can be ordered at 7,000 won each. She said that most Thai restaurants in Korea are not the Thai restaurant per se. "As a cook myself I keep talking with customers," she said. She went on to say that she is already operating two other Thai restaurants, one in Pyeongtaek's Anjeongni and the other in Songtan near Osan Aai Base. Designs and decorations were made by Malliga Vanda herself. It was 2004 that she opened her first Thai restaurant in front of the US military installation in Songtan, Gyeonggi Province. She cooked herself and greeted customers. The tiny 27-seat eatery turned out to be a huge success. On the strengths of her initial success she opened a another Thai restaurant in Pyeongtaek's Anjeongni several years later. The much larger one was also a commercial success. Then misfortune followed. Vanda married a Korean man she met in Australia when she was studying there. Her husband and his mother mistreated her. Vanda had to divorce her abusive husband. Things went from bad to worse. Her Korean business partners deceived her and swindled money out of her. Vanda said that she still is reeling from the aftermaths of her mishaps she suffered from her Korean business partners. "I had to survive here in Korea," Vanda said. "Korea is my second country and feels like my second home." She first came to South Korea in 1993 on travel and came to love Korea and Korean culture. She characterized Korean people as "being very strong," emphasizing that she came from the "land of the smile." Having an unhappy brief marriage life with her former Korean husband, she expressed that Koreans need to respect women more. She was born into a well-to-do family in the central province of "Ang Thong," some 100 km from Bangkok on Jan. 23, 1964. Ang Thong means "golden bowl," an allusion to Ang Thong's agricultural importance. Nearly every month she visits her 84-year-old father in hospital bed in her "Ang Thong" hometown. She spends her tight time reading books, making flower arrangements, and enjoying embroidery. 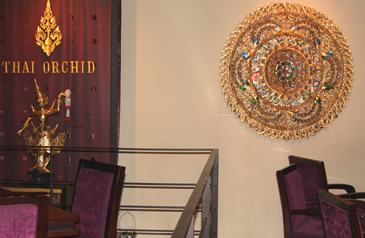 Many of the ornaments and golden designs hung on the walls of "Thai Orchid" were actually made by her. Every morning she does her physical exercise. She does her sit-ups 70 times or more in her own room to keep her body in shape. With hear-felt hospitality Malliga Vanda's face beamed with bright smile at "Thai Orchid."